Our next grant-funded student project! Next week, the KnowledgeLab is sponsoring a two day residency with activist and filmmaker Adams Wood, focused on using film as a means for social engagement. 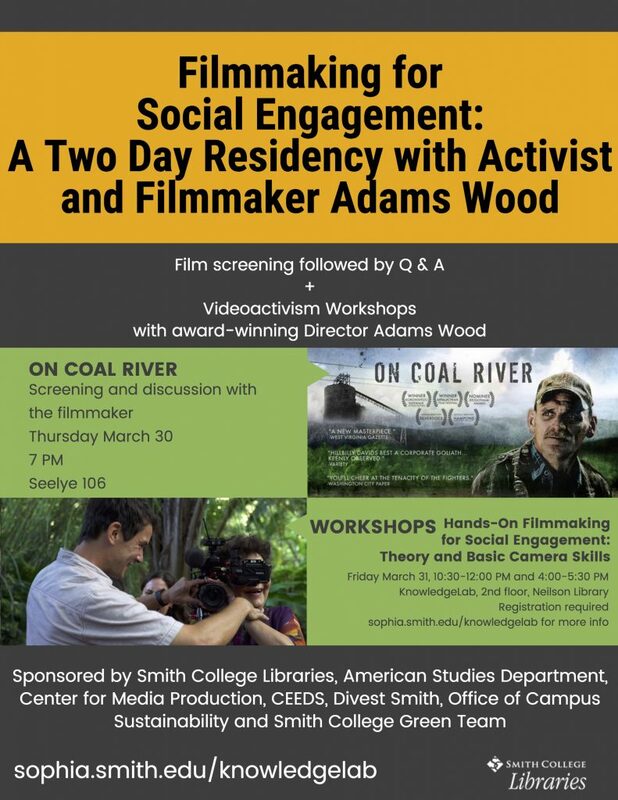 First, join us on Thursday March 30 at 7pm in Seelye 106 for a screening of On Coal River, a film that takes viewers on a gripping emotional journey into the Coal River Valley of West Virginia — a community surrounded by lush mountains and a looming toxic threat. The film follows a former coal miner and his neighbors in a David-and-Goliath struggle for the future of their valley, their children, and life as they know it. The screening will be followed by a Q & A with the filmmaker. 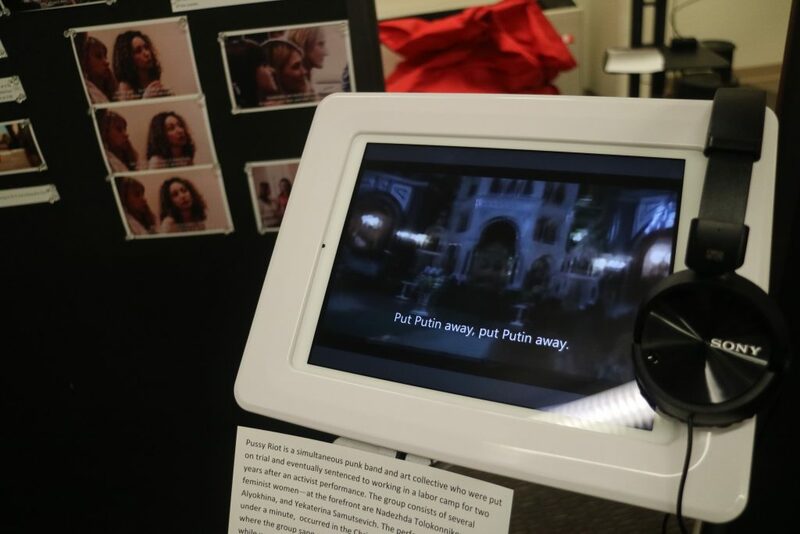 On Friday March 31, the KnowledgeLab will host two interactive workshops, Hands-On Filmmaking for Social Engagement: Theory and Basic Camera Skills, 10:30a-12p and 4:00-5:30p. These interactive workshops will offer participants basic skills and theory about the many ways video and filmmaking can be used to share knowledge and inspire engagement in a social movement context. We will discuss different forms and formats including social issue documentary, campaign and call to action videos, as well as emerging media platforms. We will screen and discuss excerpts pulled from Wood’s own work and beyond. In small group work, participants will have the opportunity to create a strategy for a hypothetical engagement goal. We will end the workshop with a brief hands-on camera training, where we will cover filming and interviewing techniques, using participant’s own cell phone cameras. Registration is required for these free workshops: Register here. This project is funded through a KnowledgeLab mini-grant to Maria Wood ‘AC. 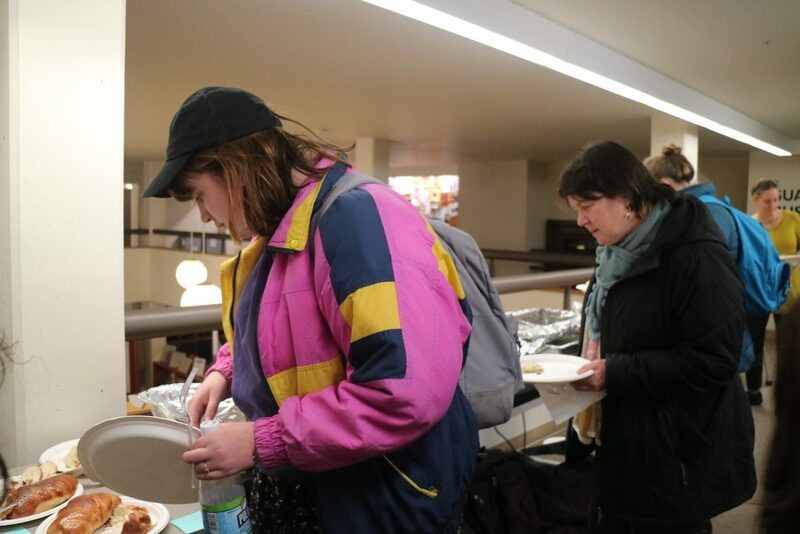 Mini-grants are available to all Smith students, faculty, classes, and student orgs for projects relating to the themes of knowledge creation, knowledge sharing, and the future of libraries and campus learning spaces, including pop-up installations, events, and more. To learn more, visit http://sophia.smith.edu/knowledgelab. 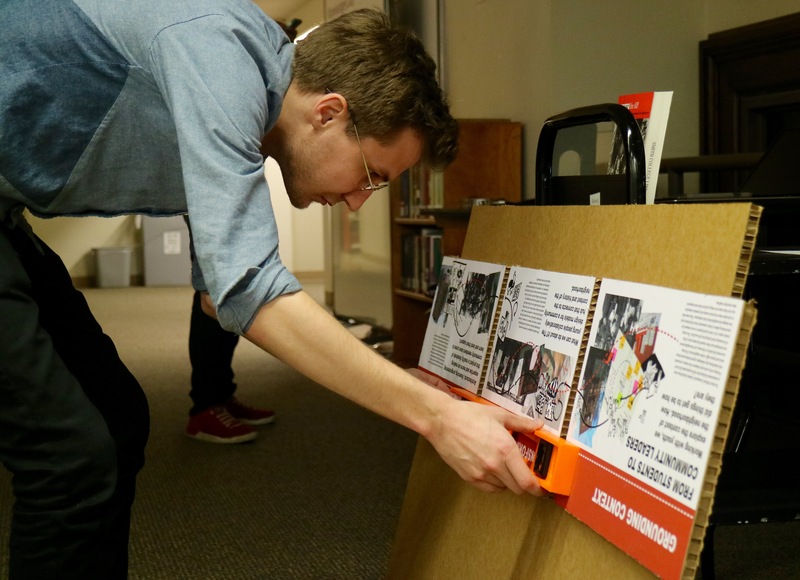 We invite you to visit and participate in an interactive exhibition and pop-up library called Undesign the Redline – created by the NYC-based social impact design collective, Designing the WE, and hosted by the KnowledgeLab on the second floor of Neilson Library at Smith College. Sign up for one of the tours with the Designing the WE team via EventBrite. Tours will be held on Feb 3, 16, 17 and March 8. On display from February 3 to March 9, the exhibit invites participants to “explore how redlining and other policies, practices, and investments create systemic disparities and inequalities that not only perpetuate our most pressing social challenges, but impede the full potential of democracy.” The exhibit has been customized for our community, with references to Pioneer Valley history and historic maps of Boston, Hartford, Holyoke/Chicopee, and Springfield. 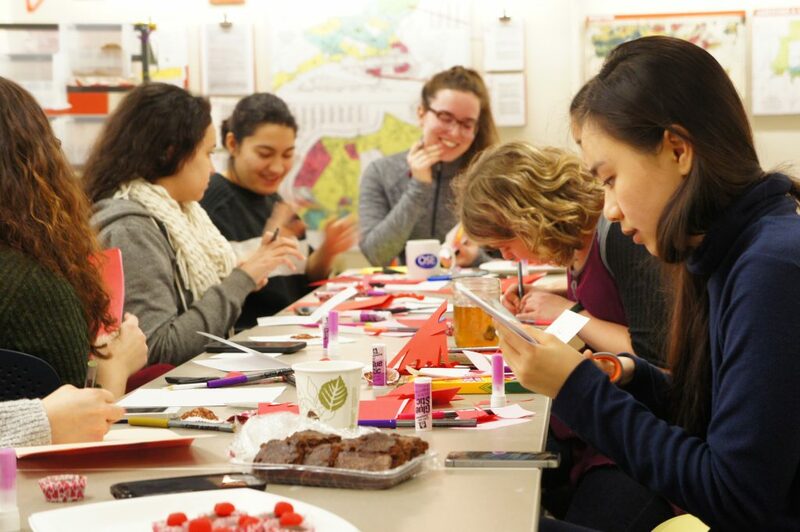 Interactive mapping projects from the Spatial Analysis Lab will be on display from Lisa Armstrong’s SWG 230 (Gender, Land and Food Movements), highlighting food access, gentrification, and the school-to-prison pipeline. Join us on February 8th for a related guest lecture by historian Nathan DB Connolly, author of the award-winning book, A World More Concrete: Real Estate and the Remaking of Jim Crow in South Florida (Chicago, 2014). On February 16th, we’ll host a dynamic panel discussion about how the design of both physical and virtual environments overlap with structures of inequality, with the Designing the WE team in conversation with the following scholars: Joseph Krupczynski, Director of the Office of Civic Engagement and Service-Learning and Associate Professor of Architecture at UMass-Amherst, and founding director of The Center for Design Engagement (C*DE), a non-profit design resource center in Holyoke; Serin Houston, Assistant Professor of Geography and International Relations at Mount Holyoke College and author of forthcoming Seattle: Real Change? ; and Chris Gilliard, Professor of writing, literature and digital studies at Macomb Community College and author of “Digital Redlining, Access, and Privacy” (2016). The series will end with a March 9th screening of MAJOR! — a documentary profile of 75 year old Black transgender elder and activist Major Griffin-Gracy, hosted by Jennifer DeClue, Assistant Professor in the Program for the Study of Women and Gender at Smith. 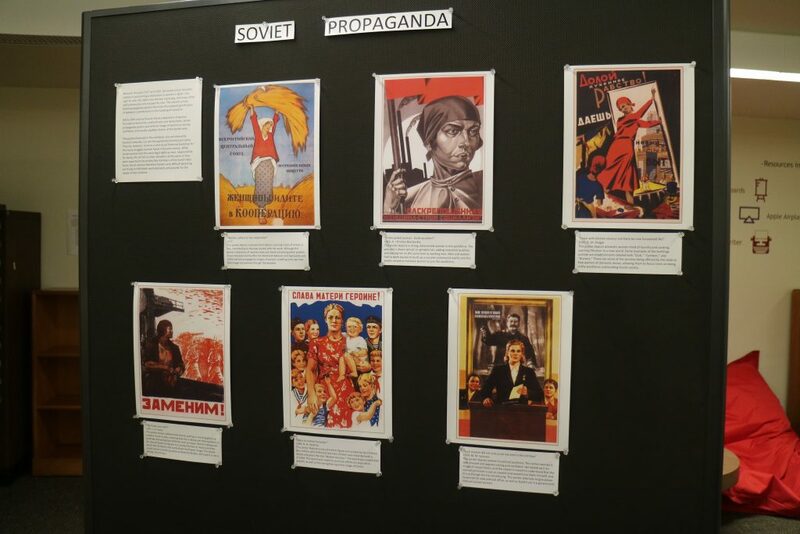 You can view the exhibit on your own at anytime the library is open. 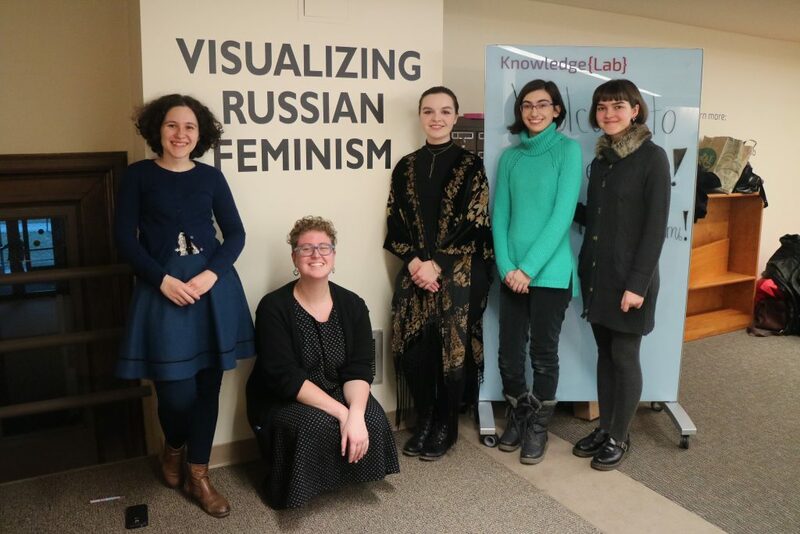 From December 9-15, 2016, the KnowledgeLab hosted Visualizing Russian Feminism, a multimedia exhibition created by students as a culminating project for RES 236, Contemporary Russian Women Writers, taught by Hilary Fink. 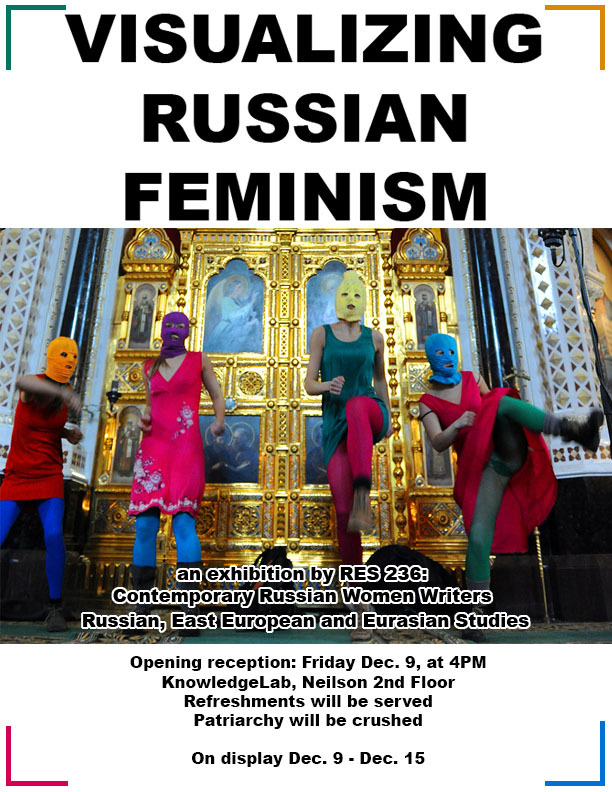 With features of propaganda posters and other printed images, video clips, writing, and a slideshow of Russian feminist photography, the exhibition showcased artistic expressions of female identity in Russia from the early revolutionary days of the Bolsheviks to the twenty-first century. 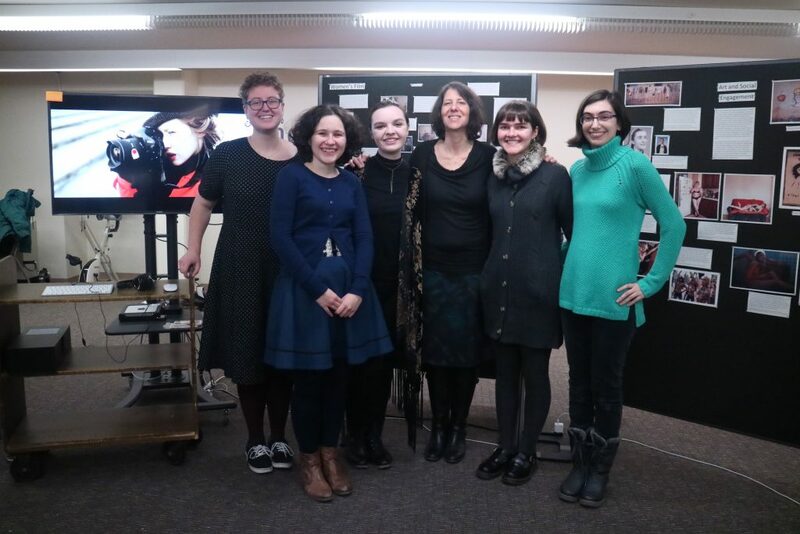 Thank you to everyone who attended the exhibit! 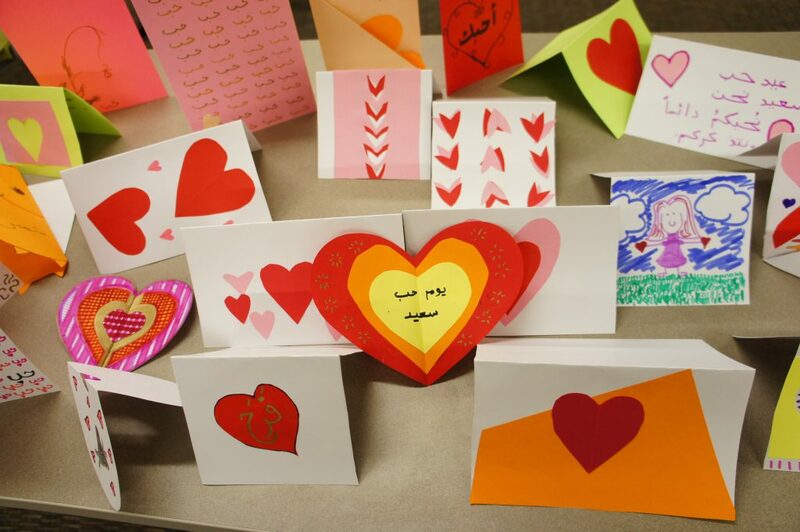 This project was funded through a KnowledgeLab mini-grant. 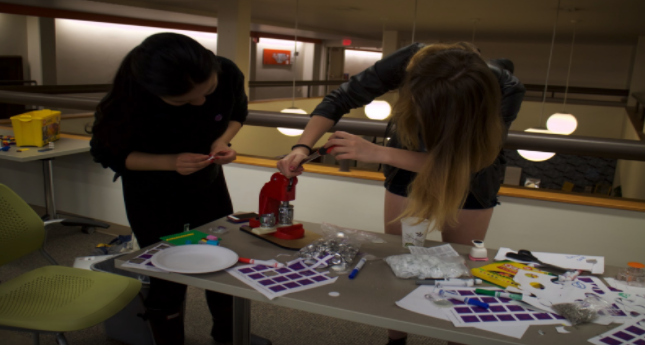 Mini-grants are available to all Smith students, faculty, classes, and student orgs for projects relating to the themes of knowledge creation, knowledge sharing, and the future of libraries and campus learning spaces, including pop-up installations, events, and more. To learn more, visit http://sophia.smith.edu/knowledgelab. Kim Lu is a senior at Smith College, majoring in Environmental Science and Policy. She is a Libraries Project Assistant for Neilson Library. 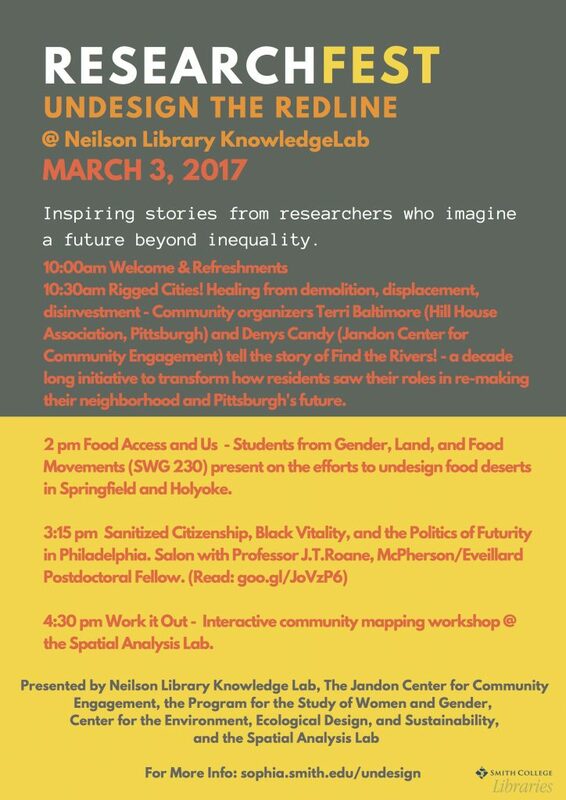 RSVP to hold a class or group discussion at the Knowledelab. 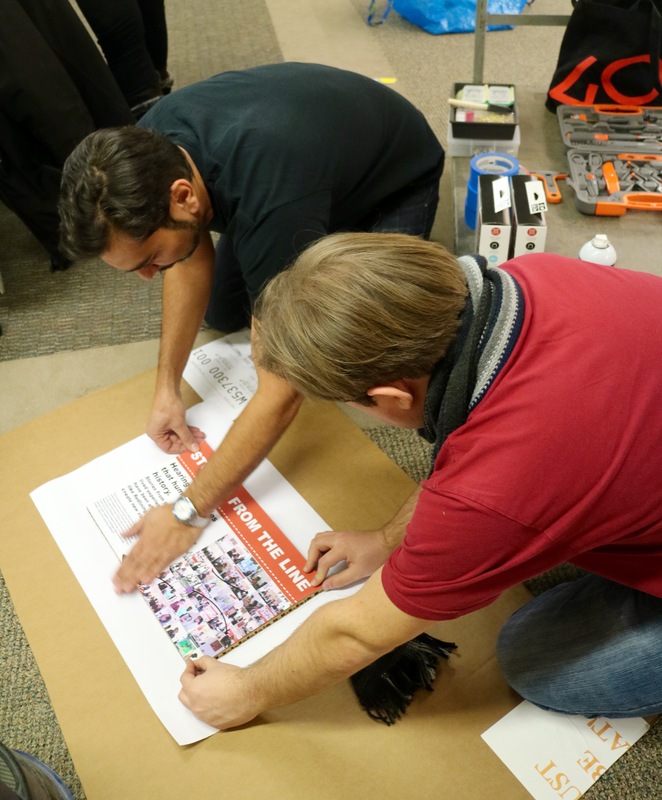 Starting on February 3, 2017, the Undesign the Redline exhibit will be featured in Neilson Library’s KnowledgeLab. 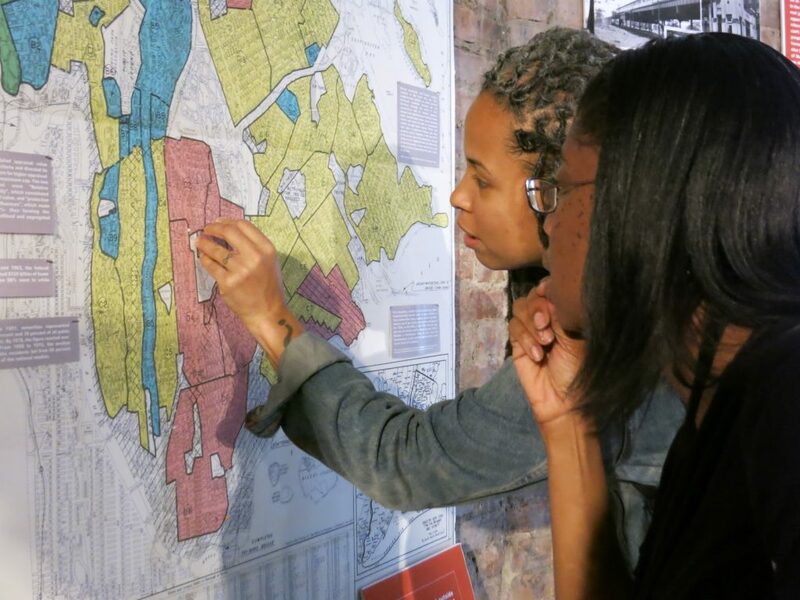 This interactive exhibit “invites participants to learn the history, interact with the stories and invent the future of undoing structural inequities.” The installation includes historical Home Owners’ Loan Corporation (HOLC) maps, an in-depth timeline, and stories from those affected by redlining, a set of real-estate practices and related federal policies that were used to discriminate against people of color and immigrants in the mid-twentieth century. February 8th – A talk given by historian Nathan Connolly, author of A World More Concrete: Real Estate and the Remaking of Jim Crow South Florida and consultant to the Mapping Inequality Project. Sponsored by the History Department and the Lecture Committee and co-sponsored by Office of Multicultural Affairs and Africana Studies. February 16th – A panel about Race and Place featuring Designing the WE partners Gregory Jost and April De Simone, in conversation with Joseph Krupczynski, Director of the Office of Civic Engagement and Service-Learning at UMass Amherst and Associate Professor of Architecture at UMass Amherst, Serin Houston, Asst. Prof. Geography and International Relations at Mt. Holyoke College and author of the forthcoming book Making Place in Seattle: The Challenges of Creativity, Sustainability, and Social Justice, and Chris Gilliard, Professor of English at Macomb Community College, author of “Digital Redlining, Access, and Privacy” – pending Lecture Committee support. Tours, talks, screenings, performances, and more. 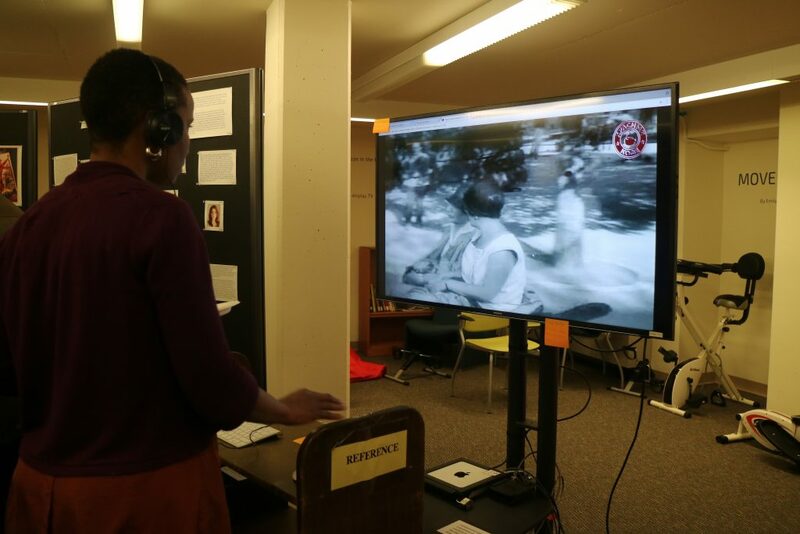 For more information, contact Digital Scholarship Librarian – Miriam Neptune, mneptune@smith.edu. To schedule a group visit, please complete the RSVP form. 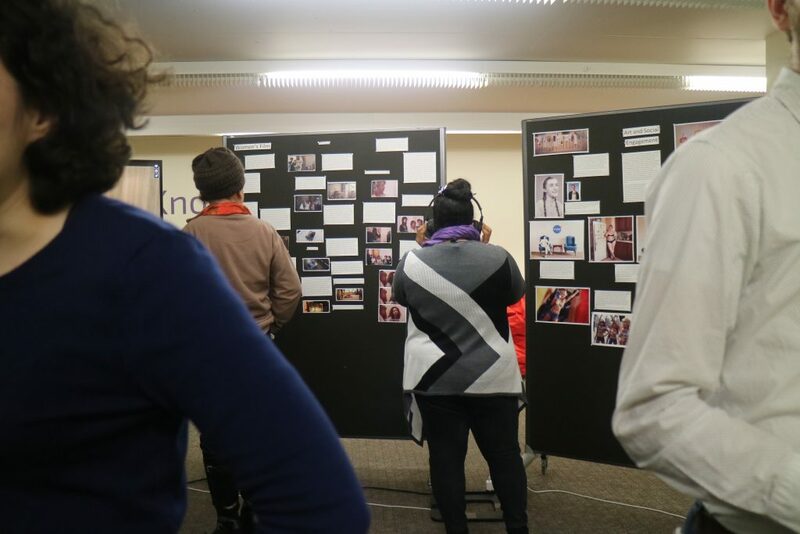 This event is co-sponsored by: Smith Libraries, the Center for Design Thinking, the Wurtele Center, the Office of Multicultural Affairs, the Department of History, and the Program for the Study of Women and Gender. Are you in a class that involves editing pages on Wikipedia? Do you have a big seminar or research paper due at the end of the semester (or sooner!)? 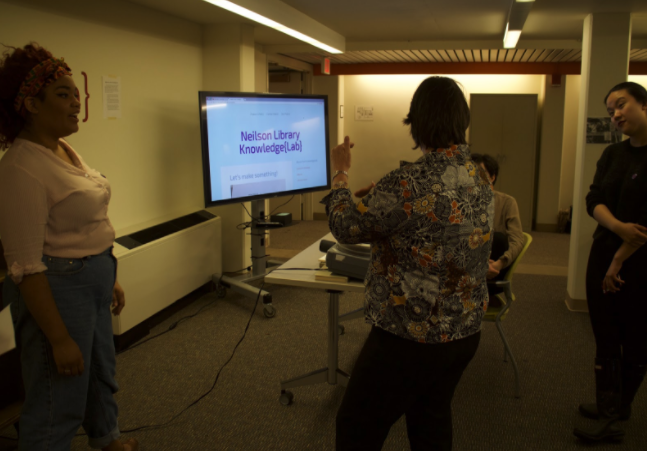 The KnowledgeLab offers drop-in hours to guide you through resources that can help! 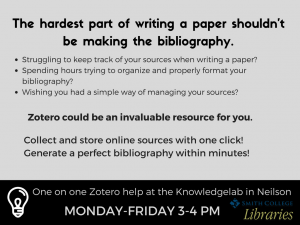 We can teach you how to become a Wikipedia editor or how to use Zotero, a powerful and handy application that stores your sources and generates bibliographies with just a few clicks. Who: the KnowledgeLab – and you! Why: the hardest part of writing a paper shouldn’t be making the bibliography! 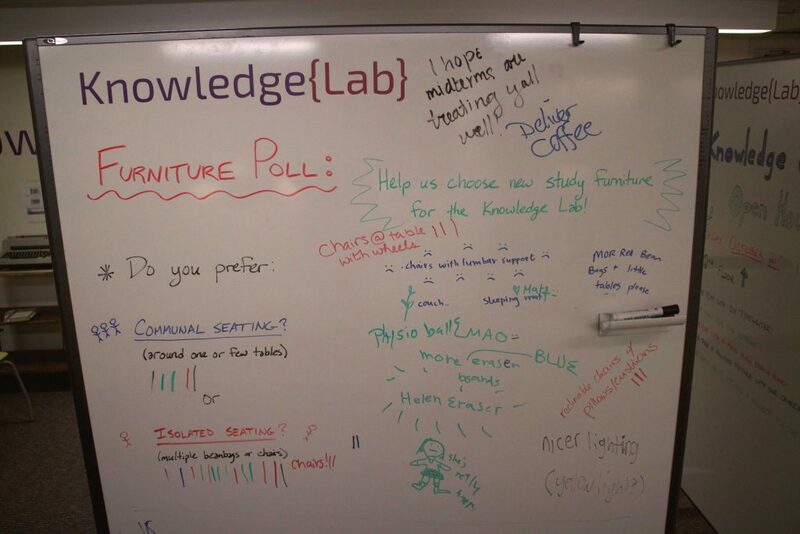 How do students want to study in the KnowledgeLab? 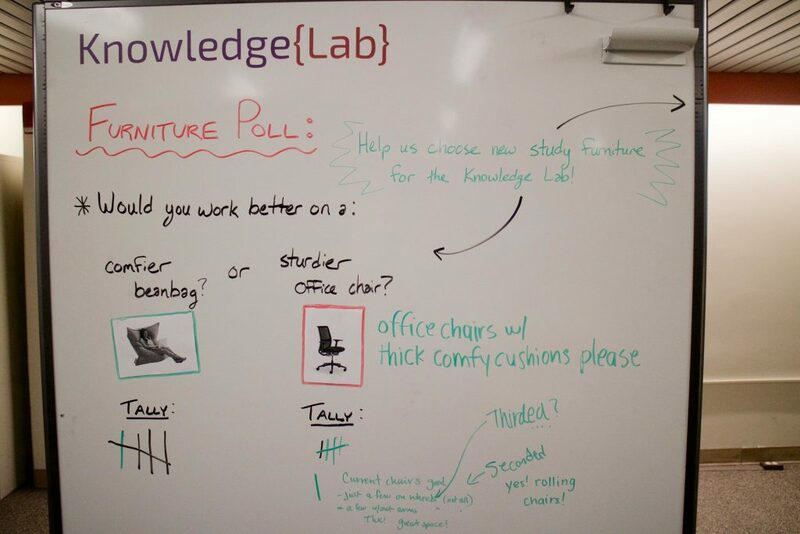 Now that the KnowledgeLab has been open to students for a few months, we’re starting to consider how we can improve the furniture options in the space to make it more usable and comfortable for our campus community. 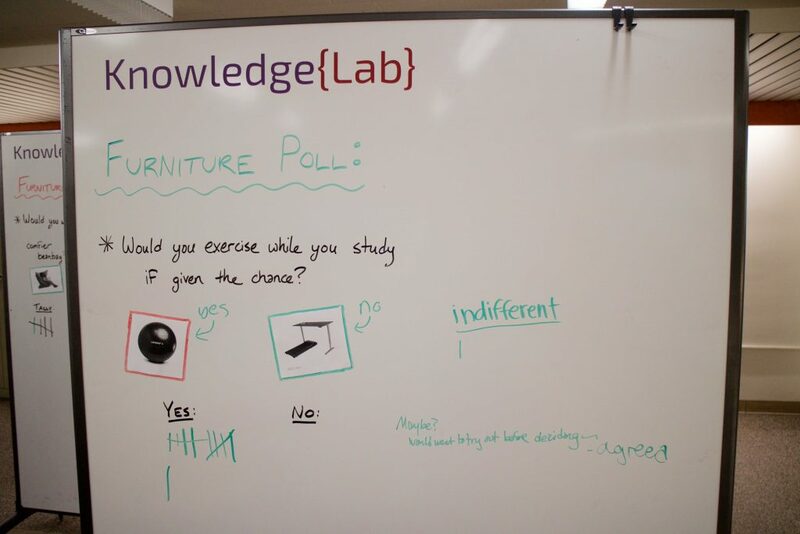 For the past two weeks, a poll was left on the whiteboards in the Knowledge Lab asking students about their opinions on new furniture. Our first questions asked whether students would exercise while they study if given the opportunity, and whether they prefer cozy beanbags or sturdy office chair seating. We found that almost everyone was open to exercising while they study. This feedback will help us in purchasing furniture like treadmill desks, where students can walk as they work on their laptops or use the desk space. The opinion on chairs was a little more split. 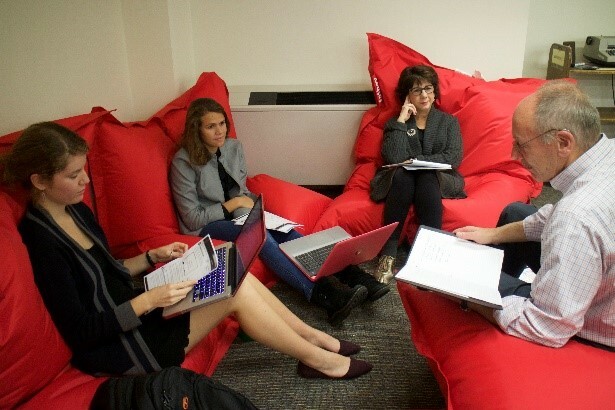 Several people voted for office chairs and several others for beanbags, but many commented that they liked the current chairs in the Knowledge Lab, which are fairly rigid. Another student commented that office chairs with thick cushions would be preferred, so this might be the best way to compromise when buying new seating. Interestingly, far more people wanted isolated seating instead of communal seating. There were also a lot of helpful requests like “chairs with lumbar support” and “more red bean bags and little tables please” that we can take into consideration when we decide on which chairs to buy. According to our second poll, more people liked cool colors better than warm colors. Others had their own suggestions such as “natural light” and “light colored wood” which are other aspects that can be important to a particular color scheme. Cool colors and lighter woods seem to be the direction we should take after this poll. 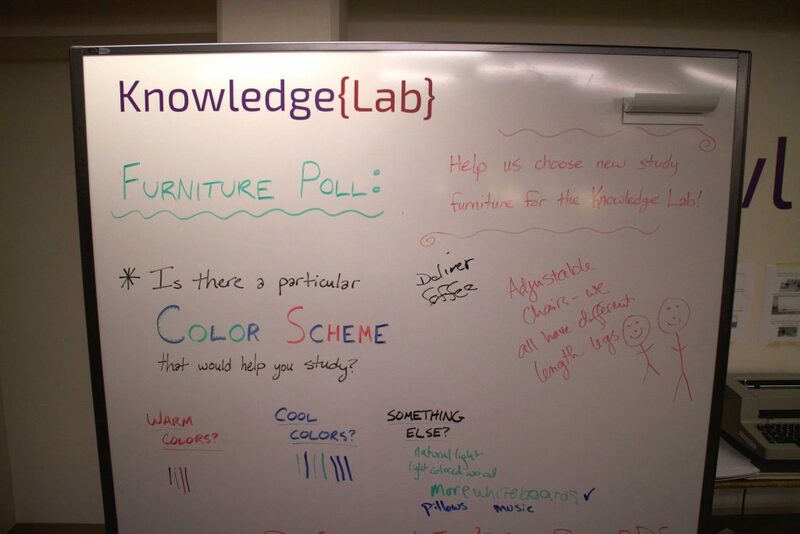 Subscribe to this blog for updates on new furniture purchases in the KnowledgeLab, and submit a project proposal if you have ideas for projects, furniture, or technology for the KnowledgeLab! On Friday, October 21st, the Knowledge Lab had its first open house! We were very happy to see all of the new faces. This was a fantastic way for members of the community to interact with this new space and learn more about what the Knowledge Lab has to offer. There are many different resources that people were able to explore, including MaKey MaKeys, the typewriter, the button maker and the Apple TV. KnowledgeLab student workers were stationed at a different part of the Knowledge Lab and got to demonstrate how folks can use the space. The Knowledge Lab is an accessible and open space with resources for everyone on campus. For example, we were able to connect the MaKey MaKey kit up to bananas and play the piano! For our younger friends who came to play, this was a fun way to get them involved in the space. Exclamations of “Woah, I’ll definitely be back here! This is so cool!” could be heard as they moved from the MaKey MaKey to the mini-projector for a Hamilton soundtrack streaming session. Thank you again to all that came out! We hope to see your faces again in the future. Sophia Buchanan is a junior at Smith College who is majoring in Government and minoring in Economics. 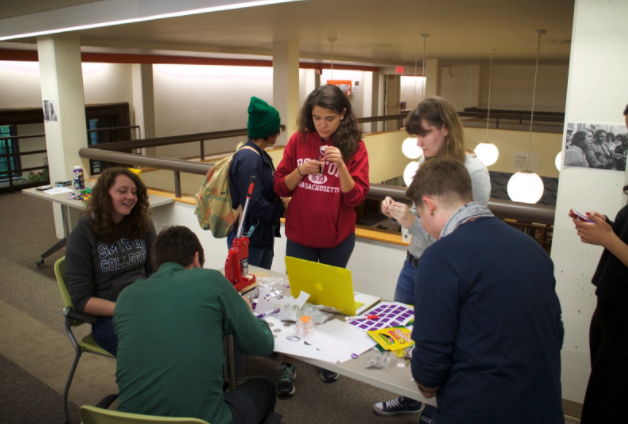 Big thanks to our Libraries student employee Phoebe Weissblum, who took all the photos for the post!